School of Fish: A new sister! In the mornings, I often sit on our front porch, drink my coffee and take some time to pray and read the Bible before the busyness of the day begins. Since we currently live in a house right between the children's houses and the school, many people walk past. There is one particular teenage girl named Esther who lives here at GSF. Recently I had been praying for her. Many mornings I greet her, but on this particular morning last week, I felt like I should tell her that I am praying for her and ask if there was anything particular she wanted me to be praying about. She told me she would talk with me that night. I was a bit intrigued, and glad she wanted to talk later. That afternoon Esther came to my house and asked my kids if she could talk with me. She snd I sat down on the front porch and I asked her again how I could be praying for her. Esther told me that she wanted to become a child of God! I talked with her about what it means to be a child of God. We talked about the fact that our sin separates us from God, but that Jesus came to make us right with God. He lived a perfect life, took the punishment for our sin when he died on the cross, and rose again to give us new life in Him. She has heard all of this many times before since she has lived at GSF for many years. But God had been working in her heart recently. After talking for a while, we prayed together. I explained that since we are both children of God, she is my sister. She was so happy and wanted to go tell Auntie Amy. She and Amy had been talking earlier in the week. I told Esther I would try to find a Bible for her. She wants to start reading the Bible and meeting to talk about it. GSF has Bibles that have been donated for the kids here, so I was able to give her one. I also asked if it was ok to share her story on my blog. She was excited to have her story online. 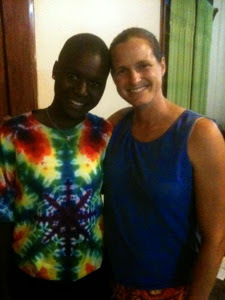 Please be praying for Esther as she grows in her relationship with God. I am so thankful that God gave me the privilege of praying with her and the opportunity to encourage her as she grows in her faith. Praise God!